Pulling from the breadth of the Bible, M.R. 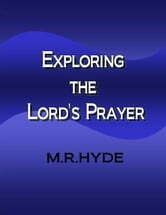 Hyde helps the reader explore some of the depths of the prayer that Jesus taught his disciples. Find new meaning and personal connection to this beloved prayer.